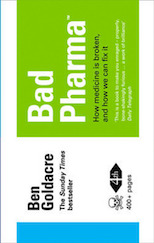 You will have noticed – from the fish oil pill saga, and the Herceptin coverage – that journalists can cheerfully make grand claims for a product which would be impossible in any advert. This week the Advertising Standards Authority ruled that the Daily Express newspaper repeatedly tried to circumvent advertising rules by running pages with a glowing, supposedly editorial article about a miracle product, and then a more sanitised, paid-for advert at the bottom. National Healthcare: a breeding ground for terrorism? Ok. This is seriously next level. Select committees are pretty much the only place in parliament where MPs do what you’d naively hope they do all the time: sit down, hear a lot of evidence on an important issue, and then have a good hard think about it. In February the Department for Innovations, Universities, Science and Skills asked you what they should be looking at. Now they’ve identified a few key areas, and have formally requested government to report back on what evidence they have to underpin their activities in each one. Subjects include regulations for synthetic biology, the teaching of ‘pseudoscience’ at universities (which I suggested last time! ), screening, the licensing of homeopathic products by the MHRA, the use of offender data, and more. They’re asking you for more, and you should give them your suggestion, instructions and email below.